Want to Know How Often You Should Post to Facebook? Improve your social media results. Get social media tips delivered straight to you inbox! Save time on social media, so you can get back to running your business. 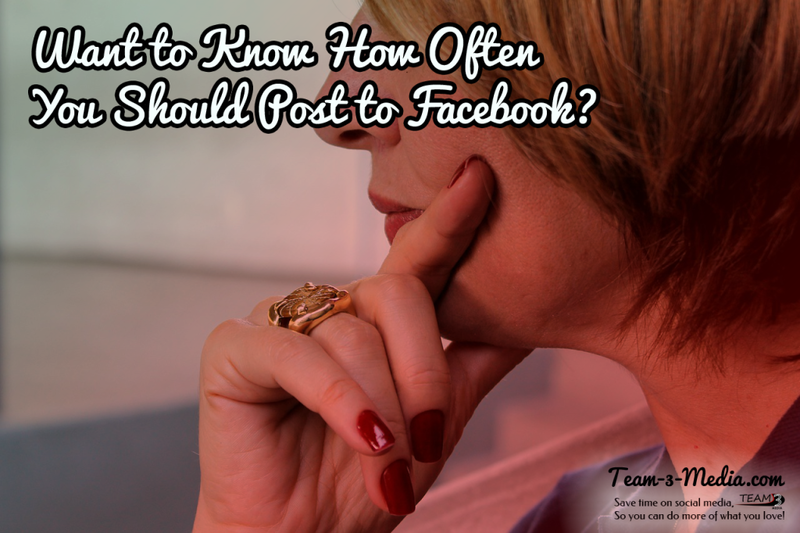 So you want to know how often to post to your Facebook Page… So, does everyone else. In fact, this is the number one question I get asked about business Facebook Pages. Before we dig into the answer (and why it’s not so cut and dried) let’s look at why this is such a big question. Why the Heck Does it Matter How Many Times I Post Per Day on my business Facebook Page?! Did you know the number of times you post per day could be limiting the number of people who see those posts? It’s true. Facebook is ruled by this super-complicated algorithm. Now, no one really knows (except for the people at Facebook) how exactly this algorithm works. But we do know a few things. We know that Facebook calculates the importance, popularity, share-ability, spaminess, etc. of each post that is published. These numbers get modified the longer a post lives. Now for each of these posts, there’s also another calculation going on. That calculation is based on each user’s preferences. It is highly based on whether a person has liked your page or whether their friend has. Whether they have interacted with any of your content and how often, or the same for their friends. It also depends on how many Facebook Pages they’ve liked, how many friends they have, what else they’ve interacted with in their news feed, how often they interact with the people and/or pages who posted those other stories, and a ton of other factors. This other calculation is the most important, because it determines which posts show up in a person’s news feed. As you can see, it gets very complicated very fast. So what does this have to do with how many times you should be posting to Facebook? The number of times you post per day is also included in that other calculation. If you post too little, your posts will eventually be shown less. So, you’d think the opposite would cause your posts to show up more, right? Unfortunately, that is not always true. In fact, you can post too much to Facebook, sending them the signal that you’re “spamming” your followers even if that was never your intention. So how often should you be posting to your business Facebook Page? Want Better Results From Your Social Media? Enter coupon code JUMPSTART at checkout to save up to 33%! A Case Study: How Often Should You Post to Your Facebook Page? Ready for a definitive answer? A real solid number you can point to and say “I did that, now what are my results?”. I thought so. Buffer, an amazing social media scheduling app, has put together some research and a great blog post on how often you should post to social media. There’s even a great infographic from SumAll (shown below) that lays it out for you. Now, this isn’t a truly definitive answer. The number of times you should post to get the maximum amount of interaction (what’s called the “sweet spot”) may be different than the number above. What this is, however, is a starting place. Give it a try, you’ll never know if it works for you unless you do. Hiya, I'm Cassie and I've been doing social media since 2008. I've managed, consulted, and built social media programs in both corporate and freelance settings. I enjoy helping business owners and managers learn to get better results out of their social media, without wasting a lot of time. I'm also a very geeky bookworm, who loves to read and watch fantasy and sci-fi shows, and play board games with my family.